Zeal – Ardor. A feeling of strong eagerness. Tireless devotion. Have you ever been so eager to get in the cages that hitting was all you could think about? Has the idea of becoming the type of ballplayer that you dream of becoming provided you with so much inspiration and passion that you just want to stand up and scream? Are you so committed to your craft in baseball that you would be willing to do anything, experience any hardship and overcome any challenge to play at the highest level? These are all questions I suggest you ponder for sometime in the near future. 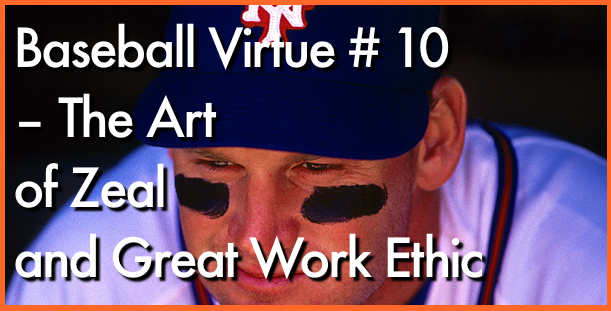 Do you have the kind of work-ethic that is going to propel you into the atmosphere of the elite ballplayers? Are you willing to use your ZEAL to get stuff done, both on the field as well as off? Show me a player with “tireless devotion” and I’ll show you one who will play at the next level despite his natural talent and potential. When you’re willing to exceed the status quo…you end up changing it.